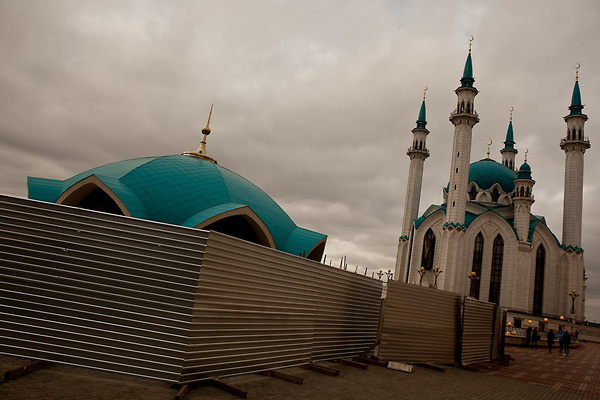 “Closed for Renovation” became a familiar refrain on my recent visit to Kazan, capitol of the Republic of Tatarstan in Russia. As host city for the 27th Universiade Summer Games, Kazan has been undergoing a makeover. Dozens of museums, hotels, and Orthodox churches and mosques (the city has plenty of both) are being cleaned up. And with less than a month to go before the opening event in the brand new 45,000 seat Kazan Arena, work across the city has reached a feverish pace. In these photographs I tried to capture this period of transition. When I was last here two years ago, new stadiums and housing blocks were going up. Now the city has 27 new sports venues, in addition to the University Village built to house 13,500 University athletes from over 170 countries. There are individual stadiums for almost every sport, including new venues for Judo, basketball, volleyball, tennis, gymnastic, rowing, swimming, wresting and more. Belt wrestling, popular in the region, is being added for the first time this year. Kazan will also be a host city for the 2018 FIFA World Cup.